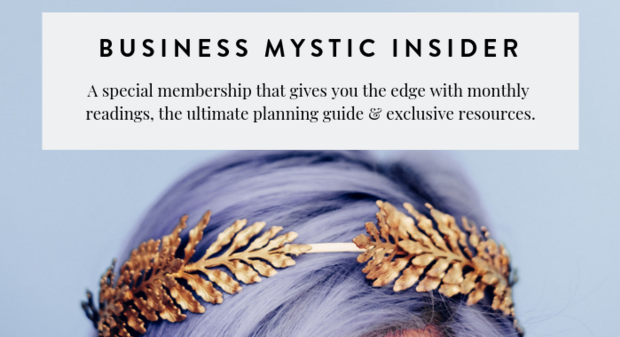 The Business Mystic Insider Membership is the place where you can take advantage of astrological and magickal energies that happen every month. As an Insider member, every month you get my detailed and easy to use LUNAR/STARS Planning Guide and individual Sun sign readings with mantras (along with exclusive curated resources!). Why is this great for you? Simply put, you'll have MORE EASE in the flow of your day-to-day and you'll feel MORE IN CONTROL of your life. Each month you receive astrology sign specific information and advice that will help guide you and give you a heads up on what the month will bring. You'll also have practical, doable advise (and a checklist!) to help you be more organized and less like you're always playing catch up. And you'll be able to make BETTER DECISIONS and respond to hiccups without feeling off your game. The cost is only $18 a month for one year. That's getting expert intuitive, business and astrological advice at a very affordable price. + What Kind of Magick Worker Are You? // Discover what your natural magickal inclination is based on your astrological sign. + Astrology 101 Course // My intro astrology course that helps you understand how astrology comes together and gives you insight on your own astrological sign. + Moon Manifesting 101 Mini-Course // An easy-to-follow process on how to use and work with the moon to achieve your goals and desires. Click link below to sign up while you still can lock in the Founding Member price for a limited time.